VANCOUVER, B.C. - Whitecaps FC came undone on the Saturday against the Philadelphia Union. In a shocking 4-0 loss on the road, Vancouver also had two players shown late red cards. Carl Robinson's team was never in the match from the first whistle. It was a poor showing after a run in which Vancouver scored sixteen goals, playing exciting football during a 2-0-4 stretch. The World Cup break did no favours for Whitecaps FC. The time off was well deserved, but the result following was unexpected. There has been talk that Robinson should have been in Vancouver at practice, coaching his team the weekend before playing Philadelphia. Instead, Robinson was in a Toronto studio providing World Cup analysis. "It's got nothing to do with me, and me being on TV or whatever." Robinson told reporters earlier this week. "I just think that's just people trying to create noise. Long travel day, the boys were great on Tuesday, Wednesday, and Friday. They looked very sharp. We looked leggy, the intensity was low. We just looked off it from the first whistle. I've got to try and find the reason why." The 6-6-5 Whitecaps came unravelled as they closed out the match at Talen Energy Stadium. Most noticeably, Yordy Reyna lashed out with a unecceasry challenge in stoppage time. The Peruvian was given a second yellow and tossed from the match. "He didn't give me a reason why." Robinson said, of Reyna. "We'll deal with that internally. That's not acceptable. I don't condone that, I could see it coming. I said to you, he's a little rogue sometimes. That rogue come out in him, but I don't condone it, and I won't accept it, so I'll deal with him internally." 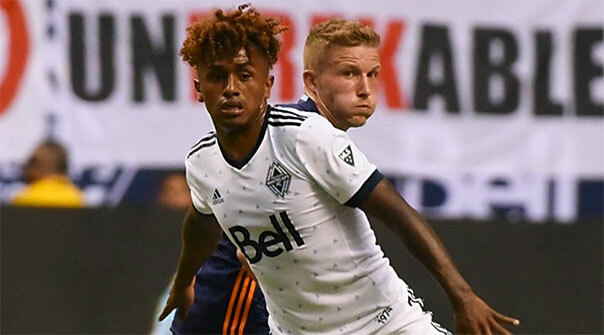 Whitecaps FC can't afford to have Yordy Reyna going rogue. The 24 year-old needs to reign in his rogue behaviour when things don't go his way. This is the second time this season Reyna has been shown a red card for lashing out at an opponent. If Reyna is going to succeed, and help Vancouver, he needs to stay in control and play to the whistle. When he does play at his best, he's scoring goals, setting up teammates, and proving to be a dangerous attacking threat. Before playing in Philadelphia, Reyna, had tallied 3 goals and 3 assists in the previous five matches. That's the Reyna, the Caps need. "What he did in the five games prior to that, he was exceptional and everyone was talking about his football." Robinson said, of Reyna. "I want my players to be talked about for the right reasons, rather than the wrong reasons, which is the challenge." We've been down the yellow and red disciplinary road before with Whitecaps FC. Kendall Waston was once a player who picked up cards like Halloween candy. The skipper has since corralled his emotions and you can clearly see how much he is helping Vancouver now that he isn't easily agitated by opposition antics. Being able to get the best out of your players while not stiffiling their abilities is key for any football manager. You want your players to play their best, and deliever. Dealing with disappointment when things don't go as planned is part of being a professional. That's the challenge Carl Robinson and his coaching staff have. How do you harness some emotion, while also making sure you still leave room for your players to be themselves. Afterall, that's what's helped them make it to where they are in football. "You've got to try and educate them and teach them." Robinson explained. "You've got to understand them and listen to them, but you can't take away what their strengths is. Usually in any people, male or female. Their strength is also their weakness, and I think we're finding that with Yordy. I've got to manage him, I'll deal with him internally. I don't want it to happen again, because he's a key player. He needs to learn, otherwise everyone is going to try and wind him up, and get him sent off." Things are going to happen when you play football, often times, you don't have too much time to react. Sometimes an instant reaction isn't always the best one. It's easy to look back at what happened, and it's important to learn if you want to go forward. "You know, we have different personalities." Felipe explained. "We have different characters. Some guys react in one way. I think the two red cards wasn't trying to get sent off. It was just trying to make the play in that moment. Sometimes we've got to think very quick, and make quick decisions. Sometimes we don't the right decisions. I think they're great guys, honest guys. I'm pretty sure that's not going to happen anymore." Felipe and the Caps will celebrate Canada Day by taking on the Colorado Rapids on Sunday afternoon at B.C. Place. The 3-9-3 Rapids have picked up 1-point on the road this season. Vancouver is playing a team that hasn't had a terrific season thus far. Whitecaps FC opened June by beating Colorado 2-1 and they'll be hoping to do the same for July..